Back in January I had the privilege of meeting up with long-time film photographer and friend Hongen. A few years back I had ditched my first DSLR in favour of a smaller Fuji X-E1 which was a mirrorless camera and a Nikon FG which is an old manual film camera that I found at an antique shop. I was becoming accustomed to cameras that allowed me to be discrete as I was shooting more and more street work. At the time, I had also reached out to my friend Hongen about film. Hongen is a friend who I went to high school with and reconnected years later when I was getting more serious about photography. I asked him all kinds of stuff: What was Ilford HP5? How do you properly shoot film? How were these developed? Despite all of my questions, he was patient with me and guided me through. I went over to visit him in the summer of 2015. He had offered to show me how to develop a roll of HP5 I had shot in his darkroom which was a laundry room he had converted at his place. He had chemicals organized on a shelf and an enlarger on a counter. I remember fumbling through the dark bag trying to get the film on the reel to the point where Hongen had to step in and load the reel himself. After rinsing out the developed film we hung them to dry and waited while looking through his collection of limited edition books and a project he had recently printed himself. I fell in love with the process of shooting, developing and seeing the prints. There was just so much care put into the work. I remember seeing the dried negatives and beaming with pride holding something I had worked on from start to finish. That summer I shot more film. By the end of August I had picked up and repaired several polaroid cameras, a few Nikons and even a Mamiya 645 film camera. I loved it, but my time shooting film was short lived for two reasons: firstly, I didn’t have convenient access to a proper lab. The closest place to me was Walmart for developing colour film and I didn’t quite trust them (eventually they got rid of their equipment and shipped their film out for development). Secondly, film was expensive. As a university student I didn’t have much money to buy rolls of film let alone develop them. Polaroid film was even more expensive at $4 a shot. I stopped bringing my film cameras with me and became solely reliant on my mirrorless camera. Getting tank and reels ready. Cutting off excess tab from film for easy loading. Fast forward to four years later. I’ve moved to Toronto, film is back in my workflow, I’m making weekly visits to a lab which is really accessible to me and does good work, and I’ve just started shooting rolls of Kodak Tri-X on a reloaded disposable. I had still kept in touch with Hongen who now has graduated from Ryerson School of Image Arts and is now a program coordinator and I remembered the time he showed me how to develop a roll of HP5. I messaged him about developing and what was needed in terms of chemicals and equipment. He kindly offered to show me how to develop Tri-X only this time in the graduate lab at Ryerson. I was thrilled! I brought two rolls of film previously shot on my disposable as well as a fresh roll to shoot while he took me on a tour of the darkrooms and the Image Arts building. It was amazing to see spaces where analog work was still being practiced daily. 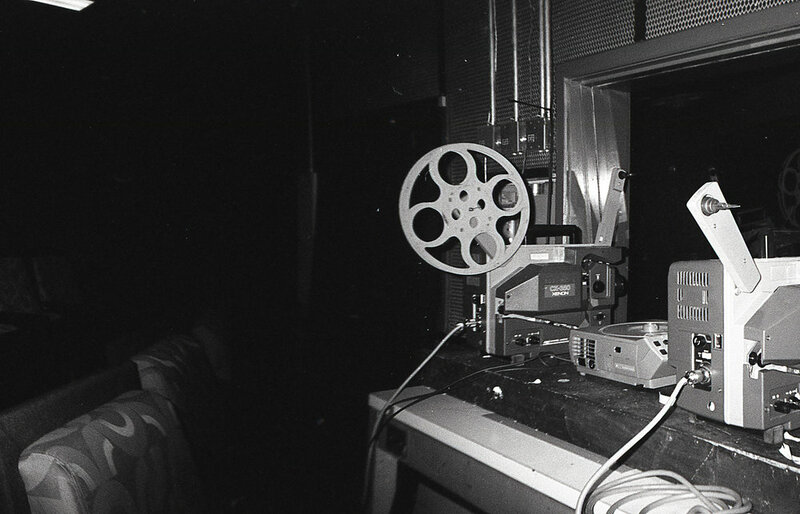 Hongen showed me around the building including places where 16mm film was being developed and spliced for video. There was even a theatre room with a film projector for viewing film footage. Despite all the advances in technology, it seems like the fundamental basics of film are still alive and thriving in this space. Hongen was kind enough to show me how to develop film similar to before but in much greater detail. He told me his experiences with certain chemicals, different film stock and what happens when negatives aren’t rinsed thoroughly after applying the fixing solution to the film. He had been developing his own film for years now and had gained a wealth of knowledge through experimentation and working with the medium. Thankfully, he was patient enough to guide me through his process. There was something about the darkroom that intrigued me. My favourite thing about it is how it was a space where you got hands on with your work. 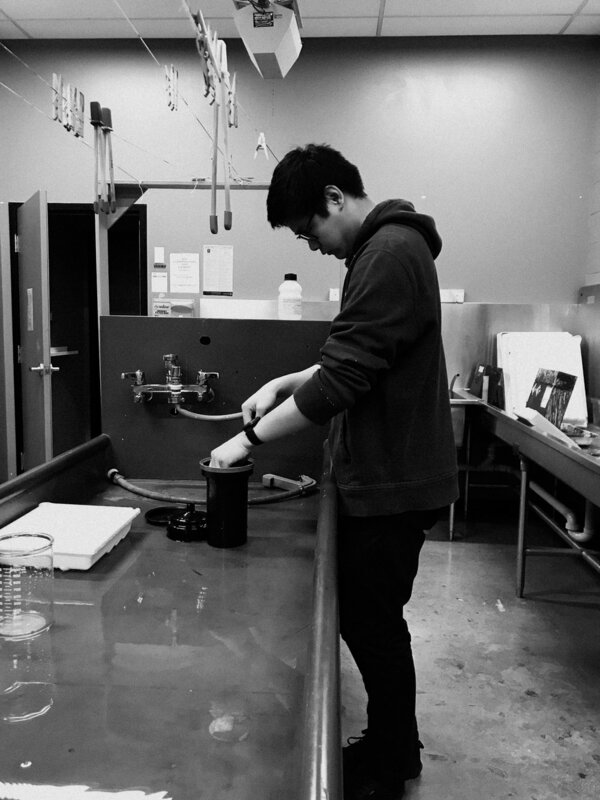 It was all about precise measurements, dilutions, timing…a whole process through which you got your negative images in the end. This isn’t to put down digital workflows. I know I’ve had some shoots where I was thankful I got shots on digital. But being able to work with something tangible and just added an extra aspect of involvement in the creation of your work. There was more work and care involved developing your own film, but the results are very rewarding. Hongen doing a final rinse. No fixer left behind. After developing and rigorous rinsing with water, the film is left to dry. During that time, Hongen and I grabbed a bowl of ramen and talked about everything from high school to upcoming projects. Film is hung to dry. I’m hoping to start developing more of my own black and white film (currently in the market for some darkroom supplies). Of course currently, most of my work is developed and scanned at Downtown Camera. 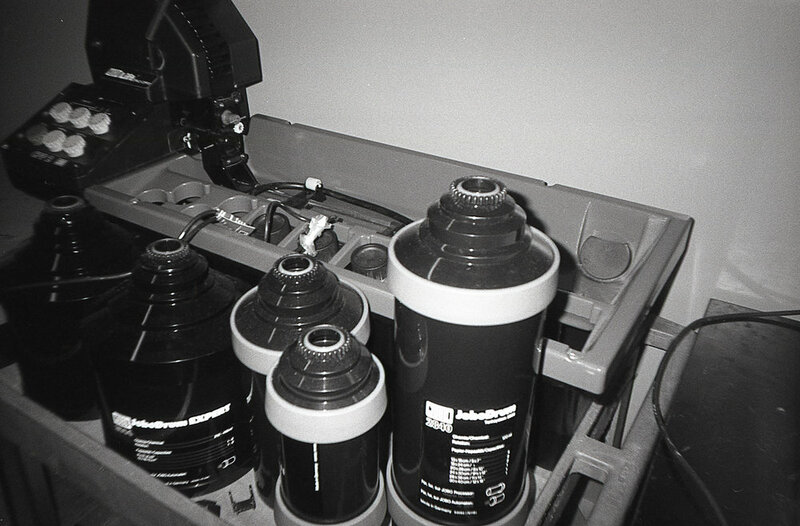 But being in the darkroom and developing my own rolls was a treat. There’s nothing quite like seeing an image you’ve created from start to finish after hours of work. Of course, there’s the whole process of scanning or even printing images using an enlarger. But even just seeing the images for the first time on a light pad just overcomes me with joy. I hope to get a kit soon and start developing more rolls of film at home. I’m curious, do you develop your own film? Or maybe you send it off to a lab. What’s your favourite part of the development process? What has made you gravitate towards film? Leave a comment below! I’d love to hear from you as well.